Well today I thought I would show you a cool video I saw on you tube- don’t ya just love that site? This shows a great low view of the chain and how it moved and reacts on a Drag bike, thought that I would share it with you today. Also a few of these videos of the drags, of course there is always something cool about a screaming 2 stroke motor. I would love this double engined H2, the guy is hard to hear but I wanted to see and hear that machine, love it!!! 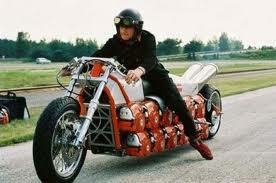 Yes, back home this fella used a bunch of KH250 triples for a 48 cylinder world record, although it weighs a Ton! Then there are the nutters in Germany that built the Chainsaw bike. Now this is right up my street, a V12 Lincoln Flathead Motor Jammed in this machine. An old KZ1300 that was brutal in its day now has a Viper V8 wedged in its place. This entry was posted in Blog and tagged 1/4 mile, 1/8 mile honda, cb550, custom, drag, flathead, hot rod, kawasaki, street race, suzuki, v12, V8, wild.